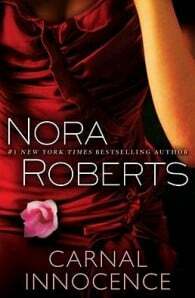 “New York Times” bestselling author Nora Roberts provides a potent mix of small-town secrets, scandalous romance, and down-home Southern atmosphere as a young woman searching for some bayou R&R finds herself entangled in a serial killer’s wicked web. Burned out and still reeling from a love affair gone bad, world-class violinist Caroline Waverly goes to her grandparents’ home in Innocence, Mississippi, for some much-needed rest and relaxation. Instead she finds herself overwhelmed all over again–first by Tucker Longstreet, a charming local with a sideline in no-strings-attached relationships, and then by a deadlier, more disturbing development. For Innocence is being stalked by its very own serial killer, whose brutal knife blows have pierced the veil of tranquillity in this sleepy Southern town and left a trail of mutilated female corpses in their wake. When a federal agent arrives to investigate, the town’s deepest secrets bubble to the surface and suspicion turns on Tucker as the most likely suspect. After Caroline finds the latest murder victim floating in the murky waters behind her house, she too is inexorably drawn into the path of a crazed killer who may be closer than she could have ever imagined.